It’s always been important to us to grow our impact within our local community just as much as growing the company. 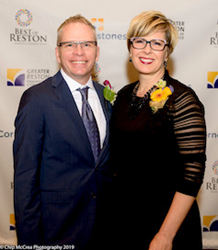 Mina and Mark Fies, owners of Synergy Design & Construction, a design-build firm located in Reston, VA, were recently recognized as a 2019 Best of Reston Honoree at an awards ceremony and gala at the Hyatt Regency Reston. The evening raised over $500,000 for Cornerstones, a nonprofit organization that promotes self-sufficiency by providing support and advocacy for those in need of food, shelter, affordable housing, quality childcare and other human services in Northern Virginia. “This honor simply reflects the big hearts and collective contributions of each individual team member,” adds Mark Fies, COO. “We count ourselves very fortunate to have such thoughtful, caring people that make up our company, serve our community and take great care of our clients." “What impresses me so much about Synergy’s work is not just the depth and breadth of the organizations they are involved in, but that Mina and Mark have made that part of their company’s philosophy and growth, for the contributions they have made personally towards causes they are passionate about and encouraging their employees to be engaged,” said Kerrie Wilson, Cornerstones’ CEO. Synergy Design & Construction is an award-winning residential design-build home remodeling firm based in Reston, Virginia. Launched at the height of the 2008 recession, their against-all-odds success story has garnered both local and national recognition, several Master Design and Contractor of the Year awards and features on the BBC, NPR and HGTV. Their commitment to developing innovative strategies and redefining the remodeling industry in includes the development of their proprietary project management system, the Renovation Roadmap™. Nearly three decades ago,Cornerstones and the Greater Reston Chamber of Commerce came together in a unique collaboration that demonstrated their mutual commitment to the guiding principles of the local community established by Reston founder Robert E. Simon and a shared philosophy the collective contributions of individuals, businesses, civic and community institutions and organizations are necessary to build and sustain thriving and enriching communities.